Welcome to the first of several guest posts on the Discover Buenos Aires site. We’re happy to give some additional exposure to other BsAs bloggers and businesses. As an expat in Buenos Aires, the occasion will eventually come up when some friends or family members may come to visit you in this far away city. The question is how will you show them a good time during their stay? 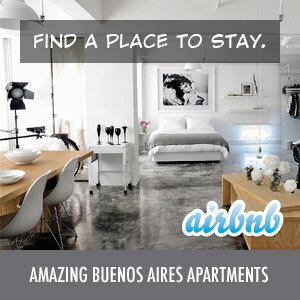 Not to worry, for Buenos Aires has so many things to do and places to visit that you may not have time to do all of it. So here is a list of a few good activities that your visitors may enjoy. You have certainly heard of the Argentine cuisine’s reputation. Well all you have heard is true, it is simply fantastic, especially when it comes to meat. So treat yourself to a dinner in a typical Parilla, where you will be able to eat so many different cuts of the best meat you have ever tried, accompanied by some of the best wine you may have ever tasted! Or you may try some of Argentina’s typical foods such as Locro. People call Buenos Aires the Paris of Latin America, and the neighborhood of Recoleta is there to prove it. Having lived in Paris most of my life, I was so surprised at the similarity in the architectural style the two cities had in common. If you had blindfolded me and taken me to Recoleta, my first reaction when you had uncovered my eyes would have been ‘I’m in Paris!’. And if you like walking the city center is a good place to go sightseeing. There may probably be no need to say this, but going to a tango show is probably THE must-do of cultural attractions in Buenos Aires. If you leave the city without having gone to at least one, then your visitors may as well not have come at all. Although many think that tango shows are tourist traps, they are part of the professionalism of the local art. Many tango show dancers are worldwide champions, and express the heart of the Porteño culture, so don’t miss out on the unique experience! Nº4: Go to Tigre and visit the Islands. If you want to escape from the noise and pollution one weekend, one of the best places to go is the city of Tigre. At not even 30 minutes away in train, this calm city is situated at the opening of the Rio de la Plata Delta, where one can enjoy a peaceful day going on a boat tour around the delta islands or visiting its famous Fruit Market. You really can’t do anything more authentic than visiting the Gauchos, either on a one day tour of a gaucho ranch or going to San Antonio de Areco for an evening, where you will be able to witness a typical Gaucho shows usually and typical Argentine asados. Buenos Aires is only a 1 hour boat ride from Uruguay’s famous city of Colonia or Montevideo, so there is no real excuse not to go. Colonia’s historical district is incredibly beautiful, and there are many good restaurants overlooking Rio de le Plata. It is a great place to take the family for a day. Montevideo is a very interesting city, great if you feel like combining a urban environment with the relaxing atmosphere of sandy beaches. You may find in the city center a few places that the Porteños may call their local ‘Broadway’. In Corrientes you may find many modern shows such as musicals or standup comedy, whereas Teatro Colon offers more classical spectacles, such as opera, or classical music concerts. Every Sunday, you will be able to enjoy the San Telmo or the Matadero Fair, where you may find typical food and goods for sale and experience typical Argentine street shows. Also a great place to take the family on a sunny day. The Best way to combine the two is visit the Mataderos Fair in the morning, then go to the San Telmo one in the afternoon as it goes on until late at night. And finally keeping the best for last, there is no way you are leaving Buenos Aires without going to a football game. With no importance The experience in the stadiums of both River and Boca are so unique that you may find going to a game at home will seem boring after this. So here are some of the best things to do with visiting friends or family in Buenos Aires. If you are looking for some more guided tours and activities in the city, check out the BsAs4U catalog, where we offer a safe online payment method with no extra fee and a 24/7 international customer service.